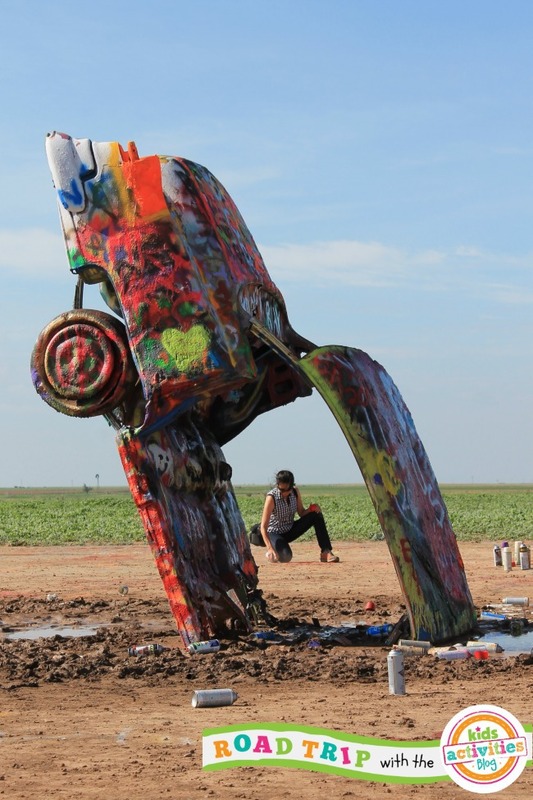 Normally, I don't allow my preschooler to handle spray paint, but at Cadillac Ranch just West of Amarillo, all visitors get to ink a hunk of vintage car. Eight Cadillacs are entombed nose down at a 45-degree angle, canvases for the curious since 1974. Simply pull off of I-40, walk through a hole in the barbed wired and up to the mega-sized art, which is submerged amidst a field of weeds. Then, pick up one of the many cans of paint littering the ground and get your art on. Charlotte, of course, choose purple paint. Today, the cars were surrounded by swampish mud, but thoughtful fellow artists had built bridges to the Cadillacs using empty spray paint cans, giving us access. I will tell you the adventure is messy: We spent just as long getting the mud and paint off ourselves as we did putting up art. Still, this roadside curiosity is very Texas ”and a great place for family pictures. You can read more about the Cadillac Ranch here.